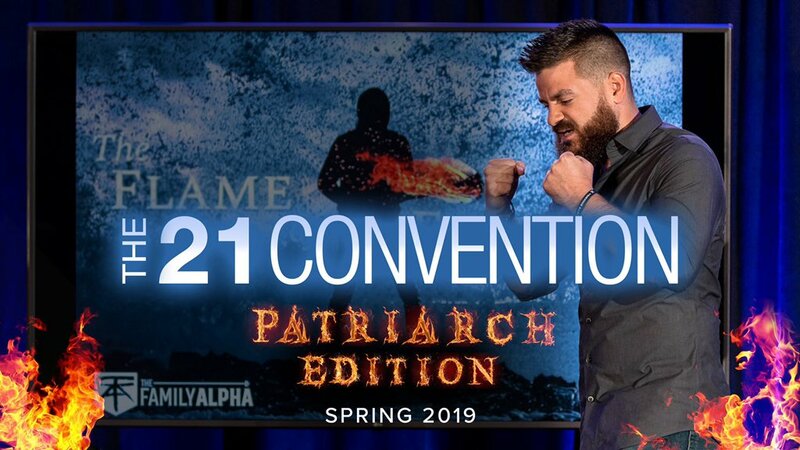 After the 21 Convention, Orlando October 2018, a few men were talking about having a convention that focused on fatherhood. Hunter Drew ran with the idea a bit and pitched Anthony on it. After most of us forgot all about it, Anthony gave Hunter the call and said, we’re doing this and Hunter is going to lead it. Outstanding. If you’ve never gotten to listen to Hunter speak live, you are missing out on one of the most high energy men out there. Anthony has a gift for running a great convention. Last year’s was one of the best I’d ever attended in terms of logistics and professionalism. In my line of work, I’ve been to many conventions over the last 30 years. #21Con was right up there at the top of them all. Anthony also has a gift for bringing men together. The list of speakers in October was as outstanding a line up as a four day event could hold. The Patriarch Edition will be a 2 day event. The only catch this time is all speakers are Fathers. And in some cases, well namely me, a Grandfather as well. This will be a high powered two days in Orlando, May 4-6. It doesn’t hurt that we will all get to celebrate Cinco de Mayo together as well. Some of the best times at these events are in the breaks, the hallways, the bar, lunches. It’s the interaction we all enjoy that tops it all off. This isn’t a convention where the speakers fly in, give their talk and disappear. Nope. We are all hanging out and having fun at times, helping others get unstuck at other times. It’s like nothing I’ve experienced before. If you want to know more about this 21 Con event, maybe just to check out the high powered lineup assembled, click this link. I hope to see you there! I can’t wait. Hi Tex. Really enjoy your writing and I’m thankful that a lot of these topics are finally being addressed from the perspective of an older guy in a committed relationship. You recently posted on twitter about questioning everything, and that triggered me to raise a question that has nagged at me off and on for quite a few years. If one looks at the speakers at the 21 convention a noticeable portion of them (and I believe this includes you) appear to use pseudonyms. Do you think it is asking too much of men who talk about being strong, standing up for themselves and their principles, and being transparent to give such lectures in their real names? Or at least make their real names easily available? I understand there can be consequences. It might cost them some money. It could result in taking some grief from family, friends, customers, online trolls etc but again isn’t that pretty minimal compared to the price some people have historically paid for standing up for what they believe in and attempting to bring about change? If it was a matter of giving advice for free on the net clinging to anonymity would just mean that I would take that kind of advice with a grain of salt. However, when it’s a situation where your thoughts and ideas are being used to try and induce men to pay thousands of dollars I think the reason for pseudonyms need to be held up to scrutiny. I hope you take this as an honest question in the manner in which it is intended. I may be the only who wrote it but I really, really doubt that I am the only one who thinks it. I can’t apeak for others but I can address me. People call me Tex in real life. As far as my last name goes, I’ve never thrown it out there for family privacy reasons. Some view D/s as abuse. Many men on twitter or in my circle of “internet” friends know my last name. I see what you are saying. I speak from the heart and it’s not too difficult to match my name to my face if you really wanted to put in a bit of effort. We live in weird times. Up until last October, my face hadn’t ever been out there at all. So small steps perhaps. The good news is that all these speakers have content available for free. And eventually all the talks are posted for free too. I appreciate you taking the time to read my stuff. Thanks. Thanks for the reply. I certainly understand your point and obviously protecting yourself and your family has to come first. I would have no respect for you otherwise. It just seems that there is an awful lot of this in what is often referred to as the manosphere including writers that have nothing to do with D/s. To me it waves a big red credibility flag in front of what is often otherwise very worthwhile and thought provoking ideas. Kind of like taking really good dietary advice from a panel of fat men or signing up for a public speaking course from someone who in real life hasn’t set foot in front of an audience in years. I disagree with your premise. Either the message is good or it isn’t.